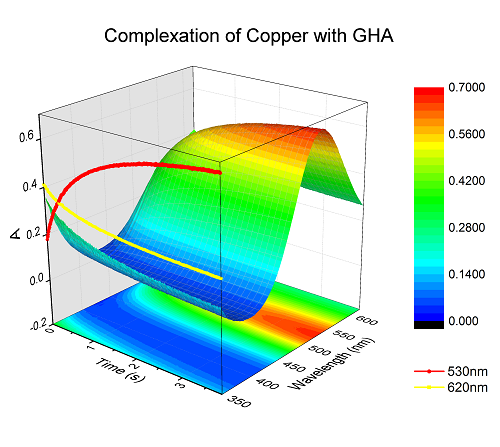 The complexation of a peptide with copper is depicted; specifically the follow-up of the reaction in the absorption according to time and wavelength. Projections of the kinetic curves are included. The data was collected by an analytical chemistry system: Stopped-Flow BIOLOGIC and imported into a matrix. About the Author: Stephane PARANT is an engineer in the team C2M2 of Pr B. HENRY (Faculty of Science and Technology) at the UHP, NANCY University (France), UMR7565, 54506 Vandoeuvre.